Through a personal narrative published on the Medicine Abuse Project's website, a mother recounts how her son died from an overdose of prescription drugs. In the article, the mother issued the following plea: "I am committed to educating young people about the incredible danger of addictive prescription drugs. Just because a doctor prescribed it does not mean it is safe. Opiate painkillers in particular are the most addictive prescription drugs and are so easy to obtain and hide. I would like to tell young people to not even think about it—and if they do become addicted and cannot stop using, to please, please ask for help." Unfortunately, this mother is not the only person who has been left painfully gasping in the wake of a loved one's unfortunate encounter with drugs. In fact, the United States is experiencing an opioid overdose epidemic. According to the Centers for Disease Control and Prevention (CDC), opioids, including prescription pain relievers and heroin, killed more than 33,000 people in 2015, more than any other year on record. As much as one-half of these opioid overdose deaths involved a prescription drug. Consider the following: The CDC reports that since 1999, the number of prescription opioids sold in the United States has nearly quadrupled, yet multiple studies indicate there has been no change in the amount of pain that Americans report. According to the CDC, since 1999, deaths from prescription opioids—such as oxycodone, hydrocodone, and methadone—have quadrupled. In addition to the toll drug abuse is taking on human lives, it is also having a financial impact. According to a recent report from the Surgeon General, $420 billion is spent annually on abuse-related health care, criminal justice, and lost productivity. These unsettling stats have resulted in a call to action. States have answered the bell by developing and implementing Prescription Drug Monitoring Programs (PDMPs), electronic databases used to track the prescribing and dispensing of controlled prescription drugs to patients. These state-run initiatives are designed to monitor this information for suspected abuse or diversion (ie, channeling drugs into illegal use), and can supply prescribers and pharmacists with critical information regarding a patient's controlled substance prescription history. Currently, 49 states and the District of Columbia utilize a PDMP. The good news is that these databases are having a positive impact, helping to detect "doctor shopping" and identify fraudulent, forged, or deceitful prescriptions for controlled substances. In fact, one recent study in Health Affairs showed that in the year after a PDMP was implemented, states experienced an average decrease of 1.12 opioid-related deaths per 100,000 persons. Seamlessly share data across state lines. While many of the state PDMPs allow providers and pharmacists from neighboring states to access their databases, the information is not stored in a centralized location. Therefore, health care professionals must look up the information on a one-off basis, a time-consuming and laborious process. At the same time, many of the questionable "actors" trying to illegally obtain drugs are not doing so simply for personal use but are part of larger, more sophisticated criminal enterprises. Therefore, it is becoming increasingly difficult to solve a national problem with only local solutions. Efficiently access patient-specific information. 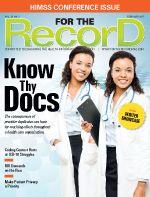 In most instances, providers and pharmacists need to go outside of their established and preferred workflows to access the PDMP databases. For example, when a physician is writing a prescription for a controlled substance, instead of gaining access to PDMP information as he writes the prescription, he is forced to access the database separately to determine whether there is the potential for abuse by the patient in question. The extra step is one reason many physicians simply don't use the PDMPs. In fact, a survey of primary care physicians published in the March 2015 issue of Health Affairs showed that the majority of the physicians knew about their state's PDMP; however, only about one-half accessed the databases. Quickly identify at-risk patients. With the PDMPs, clinicians currently are required to seek information every time they write a prescription for a controlled substance; there is no way to determine whether a patient is likely to be an abuser. For example, physicians are required to do the same type of information gathering for a patient who is being prescribed a narcotic for the first time as for a patient who has been seen by numerous doctors and has been prescribed a variety of narcotics and controlled substances over the past three months. Enable patients with legitimate pain needs to get drugs. As the prescription drug abuse epidemic continues to unfold, many physicians are becoming afraid of potential legal consequences. As a result, some are throwing in the towel and refusing to accept pain management patients into their practices. By doing so, they don't have to worry about illegally providing prescription drugs to abusers or criminals. The unfortunate upshot of this behavior is that patients with a legitimate need for pain management medications are sometimes denied access. In such cases, the prescriber is unfortunately putting compliance with the law ahead of the patient's clinical concerns. What's needed to move beyond the limitations associated with the state-run drug monitoring programs is a standardized, nationwide solution to ensure patient safety that will enable providers and pharmacists to gain access to information about all patient prescriptions across the country. This national database could be developed so that states are able to maintain their individual privacy and security settings while enabling access to comprehensive national prescription drug information. What's more, by using the existing National Council for Prescription Drug Programs communication standards that link physicians, pharmacies, and third parties and are used for billing purposes and ePrescribing, the national solution could be implemented without having to force clinicians outside of their established workflows. With this national model in place, providers and pharmacists would have access to all prescription information in one location instead of relying solely on their state's or bordering states' data. This national solution would make it possible to identify patients at risk for drug abuse by analyzing how many pharmacies they have visited, the number of narcotics they have been prescribed, how many physicians they have seen, and the conditions they suffer from. The database would also include specific content that would make it possible to recognize drugs likely to be abused. In addition, the national solution could leverage algorithms to quickly identify "bad actors" who are obtaining drugs for illegal resale. • permit easy access to patients who legitimately need prescription drugs. The PDMP would move beyond acting merely as a law enforcement tool and support the delivery of appropriate and improved clinical care. Perhaps most importantly, the national PDMP could then help to more effectively control the drug overdose epidemic that has virulently spread throughout the country in recent years. — Tom Bizzaro, RPh, is vice president of health policy and industry relations for FDB (First Databank, Inc.), where he is responsible for proactively monitoring all health care policy issues and proposals emanating from both the federal and state governments as well as participating in health policy initiatives related to the use of electronic drug information.